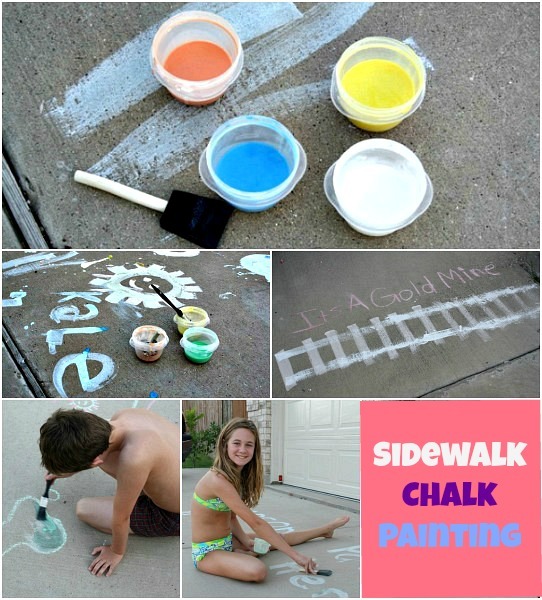 Keep your kiddos busy this summer with this simple DIY Sidewalk Chalk Paint! ☀️ Sidewalk or Drive Way Chalk Painting is a fun - outdoor- summer activity your kids will love. 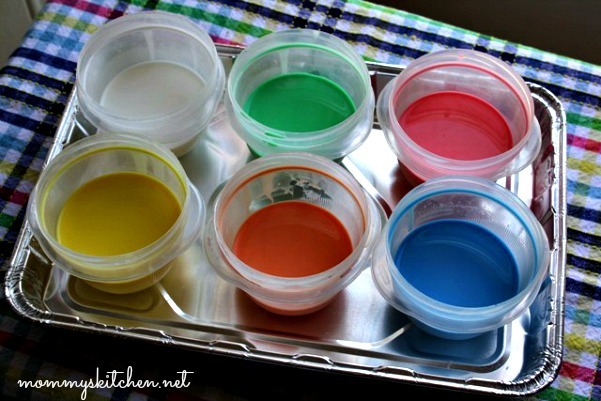 It has been quite some time since I've done a Crafty post on Mommy's Kitchen. I usually post them in the summer, because that's when the kids and I have the most time to devote to crafts. I'm sure you have already heard those famous words of summer....... "Mom I'm bored". We all look forward to summertime, but then comes the task of keeping everyone occupied and busy. This year we planned a Summer Bucket List to try and help that situation. We have been very busy crossing off all the things on our to do list. One activity we had planned was to make homemade sidewalk chalk, but our plans quickly changed to DIY Sidewalk Chalk Paint instead. I know you can purchase sidewalk chalk paint, but whats the fun in that? If you knew me you would understand. Since my kids were born I have always tried to put a frugal spin on some of our favorite crafts, cleaners and remedies. If I see something I like in the store I always tell myself I can make it for pennies less. Any chance I get I try to instill frugality in my children. It's the one thing I learned growing up in a family of 6. We didn't have a lot money, so we made homemade items quite often. There's no shame in being a penny pincher and you can always have a bit of fun and learning along the way. Sidewalk chalk paint is easy to make, and requires just a few household ingredient that you probably have in your pantry. Cornstarch, water and food coloring. I chose to use Washable Tempura Paint since we had plenty on hand. I was also worried that the food coloring would be hard to wash off, but I have since read that it comes off pretty easily. I purchased everything I needed at Walmart, cornstarch, washable paint, water (free), paint brushes, and plastic containers with lids. I love the little Rubbermaid TakeAlongs pictured above. They're the perfect size for snacks, lunch box treats and arts & crafts. The lids twist on so there is no spilling and they're dishwasher safe. For the brushes we chose the ones back in the paint department. They had some for $1 and sponge brushes for .50 cents. Once the kids and I mixed up all the ingredients off they went to do some painting. We waited until later in the evening when it cooled down which gave us a little bit of shade. Once the kids stated painting my daughter said... this doesn't work. I told her just give it a second to dry and you'll see. She didn't understand that the sidewalk chalk paint starts out light and then darkens as it dries. Once she got going she was amazed at her artwork and couldn't believe her eyes. I love that this is a messy activity that can be done outside. Just a quick rinse of the driveway and everything will be back to normal. The kids were so proud of their artwork that we left it on display for a couple days. They're already asking me when we can mix up another batch and paint again. 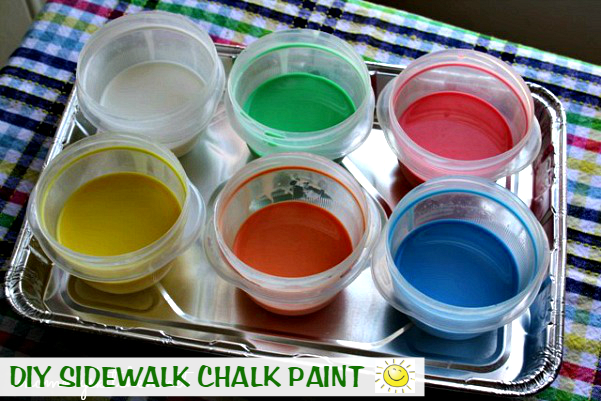 If you're looking for cheap fun activity to keep your kids busy, DIY Sidewalk Chalk Paint is a must try. In each plastic cup add 1/3 cup cornstarch to 1/3 cup water or whatever equal parts you prefer. Mix to combine. Add 1 -2 tablespoons of paint or several drops of food coloring into each cup and stir until your desired color is reached. Note: The cornstarch will settle a bit as the paint sits, so give the paints a good stir and have fun. This is a sponsored post. As a participant in the Walmart Moms Program, I have received a Gift Card and compensation for my time and efforts in creating this post. All thoughts and opinions stated above are 100% entirely my own. This worked so well! Thanks for the fun. Will any washable acrylic paint work too? I have only used the washable paint pictured in the photos. Can you make it the day before? Or just right before you use it? Awesome! Painted our WHOLE street with this stuff this afternoon. Worked great. But we ran out of cornstarch so we used all purpose flour for some. And then we used baking soda in some. And then we sprayed it with vinegar water to make it EXPLODE ( sort of). Only one neighbor was making call to City Codes. It was great!!! Everything was back to normal with a squirt of the garden hose except that grouchy lady. Will this stain light concrete? No it is washable paint. It dries like chalk. Hi there. Do you think instead of food coloring or paint I could use the dust from chalk? That's what a lot of people have been doing and they mixed that with water.